SEOUL, South Korea -- South Korea's Defense Ministry said on Monday that North Korea appeared to be planning another missile launch, possibly of an intercontinental ballistic missile (ICBM) to show off its claimed ability to target the United States with nuclear weapons. The South fired missiles into the sea on Monday to simulate an attack on North Korea's main nuclear test site, a day after Pyongyang detonated its largest nuclear test explosion to date, drawing international condemnation. Despite the heated rhetoric between Washington and the Kim Jong Un regime, CBS News correspondent Ben Tracy reports it is South Korea that faces the most dangerous, most direct threat from the North's weapons, and the South responded to the sixth nuclear test quickly and fiercely. What non-military options does U.S. have to address N. Korea crisis? In addition to the missile drill, Seoul said Monday that it would temporarily deploy four additional launchers of the U.S. THAAD missile defense system, once it finished an environmental impact assessment. That proclamation quickly highlighted the difficulties of unifying other nations around a response to the North Korean threat. China and Russia strongly oppose the THAAD deployment in South Korea, with Beijing complaining that its powerful radar can probe deep into its territory, posing a security threat. Russia's Deputy Foreign Minister Sergei Ryabkov said on Monday that any further U.S. THAAD hardware placed in South Korea would force Moscow to, "raise the question about our reaction -- about our military balances." The THAAD systems are also controversial inside South Korea. With protesters trying to block their deployment over environmental concerns for years, South Korea's new president was himself resistant to putting more of the anti-missile installations in the country. As Doane reports, Kim's test of an even more powerful nuclear device seems to have eased those concerns. The South Korean news agency Yonhap reported Monday that Washington and Seoul were also discussing deploying an American aircraft carrier and strategic bombers to the region. Chang Kyung-soo, an official with South Korea's Defense Ministry, told lawmakers on Monday that Seoul was seeing preparations in the North for an ICBM test, but he didn't provide details about how officials had reached that assessment. Chang also said the yield from the latest nuclear detonation appeared to be about 50 kilotons, which would mark a "significant increase" from North Korea's past nuclear tests. According to South Korean lawmakers, the country's National Intelligence Service (NIS) informed them in a closed meeting that Pyongyang may carry out another ICBM test around the anniversary of the regime's foundation on Saturday, or the anniversary of the establishment of the ruling political party, on Oct. 10. U.S. Defense Secretary James Mattis warned the North on Sunday that, "Any threat to the United States or its territories, including Guam or our allies, will be met with a massive military response -- a response both effective and overwhelming." President Trump's national security adviser H.R. McMaster spoke with his South Korean counterpart on Monday, meanwhile; the third time the two have spoken since the North's nuclear test. South Korea's presidential office said Chung Eui-yong, President Moon Jae-in's national security director, spoke with McMaster for 30 minutes to discuss the latest updates on the two countries' response to the North's test and their future response. The heated words from the United States and the military maneuvers in South Korea are becoming familiar responses to North Korea's rapid, as-yet unchecked pursuit of a viable arsenal of nuclear-tipped missiles that can strike the U.S. The most recent, and perhaps most dramatic, advance came Sunday in an underground test of what leader Kim Jong Un's government claimed was a hydrogen bomb, the North's sixth nuclear test since 2006. CBS News' Doane reports the man-made quake caused by the nuclear test was felt in both China and Russia. Scientists believe it was potentially 10-times more powerful than the North's last nuclear test, and at least five times the explosive power of the bombs the U.S. dropped on Hiroshima and Nagasaki at the end of World War II. In a series of tweets Sunday, President Trump threatened to halt all trade with countries doing business with the North, a veiled warning to China, and faulted South Korea for what he called "talk of appeasement." On Monday, China called Mr. Trump's threat unacceptable and unfair. South Korea's military said its live-fire exercise was meant to "strongly warn" Pyongyang. The drill involved F-15 fighter jets and the country's land-based "Hyunmoo" ballistic missiles firing into the Sea of Japan. The target was set considering the distance to the North's test site and the exercise was aimed at practicing precision strikes and cutting off reinforcements, Seoul's Joint Chiefs of Staff said. Each new North Korean missile and nuclear test gives Pyongyang's scientists invaluable information that allows big jumps in capability. North Korea is thought to have a growing arsenal of nuclear bombs and has spent decades trying to perfect a multistage, long-range missile to eventually carry smaller versions of those bombs. Both diplomacy and severe sanctions have failed to check the North's decades-long march to nuclear mastery. Mr. Trump, asked by a reporter in Washington if he would attack the North, said: "We'll see." No U.S. military action appeared imminent, and the immediate focus appeared to be on ratcheting up the economic penalties, which have had little effect thus far. In brief remarks after a White House meeting with Mr. Trump and other national security officials, Mattis told reporters that America doesn't seek the "total annihilation" of the North, but then added somberly, "We have many options to do so." Mattis also said the international community was unified in demanding the denuclearization of the Korean Peninsula, and that Kim should know Washington's commitment to Japan and South Korea is unshakeable. Sunday's detonation builds on recent North Korean advances that include test launches in July of two ICBMs. The North says its missile development is part of a defensive effort to build a viable nuclear deterrent that can target U.S. cities. 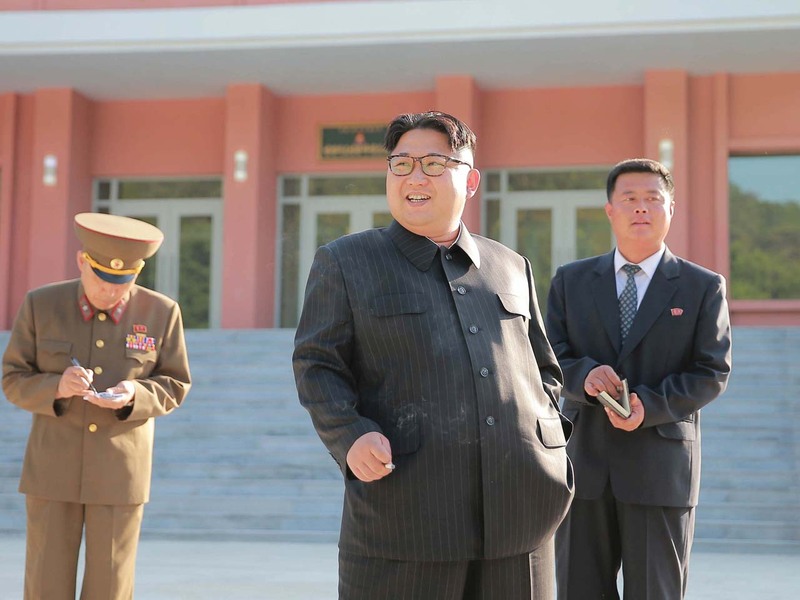 Pyongyang has made a stunning jump in progress for its nuclear and missile program since Kim rose to power following his father's death in late 2011. The North followed its two tests of Hwasong-14 ICBMs, which, when perfected, could target large parts of the United States, by threatening to launch a salvo of its Hwasong-12 intermediate range missiles toward the U.S. Pacific island territory of Guam in August. It flew a Hwasong-12 over northern Japan last week, the first such overflight by a missile capable of carrying nukes, in a launch Kim described as a "meaningful prelude" to containing Guam, the home of major U.S. military facilities, and vowed to launch more ballistic missile tests targeting the Pacific. Ahead of the North's test, photos released by the North Korean government showed Kim talking with his lieutenants as he observed a silver, peanut-shaped device that was apparently the purported thermonuclear weapon destined for an ICBM. The images were taken without outside journalists present and could not be independently verified. What appeared to be the nose cone of a missile could also be seen in one photo, and another showed a diagram on the wall behind Kim of a bomb mounted inside a cone. The Arms Control Association in the United States said the explosion appeared to produce a yield in excess of 100 kilotons of TNT equivalent, which it said strongly suggests the North tested a high-yield but compact nuclear weapon that could be launched on a missile of intermediate or intercontinental range. Beyond the science of the blast, North Korea's accelerating push to field a nuclear weapon that can target all of the U.S. is creating political complications for Washington as it seeks to balance resolve with reassurance to allies that Washington will uphold its decades-long commitment to deter nuclear attack on South Korea and Japan. That's why some questioned Mr. Trump's jab at South Korea. He tweeted that Seoul is finding that its "talk of appeasement" won't work. The North Koreans, he added, "only understand one thing," implying military force might be required. The U.S. has about 28,000 troops stationed in South Korea and is obliged by treaty to defend it in the event of war. Mr. Trump also suggested putting more pressure on China, the North's patron for many decades and a vital U.S. trading partner, in hopes of persuading Beijing to exert more effective leverage on its neighbor. He tweeted that the U.S. is considering "stopping all trade with any country doing business with North Korea." Such a halt would be radical. The U.S. imports about $40 billion in goods a month from China, North Korea's main commercial partner. Experts have questioned whether the North has gone too far down the nuclear road to continue pushing for a denuclearization of the Korean Peninsula, an Obama administration policy goal still embraced by the Trump White House. "Denuclearization is not a viable U.S. policy goal," said Richard Fontaine, president of the Center for a New American Security, but neither should the U.S. accept North Korea as a nuclear power. "We should keep denuclearization as a long-term aspiration, but recognize privately that it's unachievable anytime soon."